The pastoral valley of Marrowdell is home to a small pioneer settlement of refugees, lush fields of grain, enigmatic house toads - and Jenn Nalynn, the miller's daughter. Life here is full of laughter and peace, as well as hard work, and no one bothers overmuch about the outside world. Jenn longs to travel, to seek what's missing in her life. Not that she's sure what that is, but since this summer began, she's felt a strange and powerful yearning. She's certain she'll find what she needs, if only she can leave the valley. Jenn is turn-born and cursed, born by the light of two worlds and bound to both. For the valley is more than it seems. Long ago, a cataclysm of misused power pinned Marrowdell to the Verge, a place of wild magic, home to dragons and even stranger creatures. 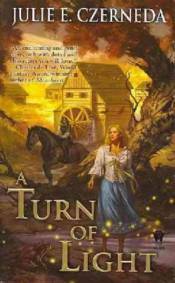 Should Jenn step beyond Marrowdell, she will pull the worlds asunder. To prevent this, powers from the Verge have sent a guard to watch over her, a disgraced dragon Jenn knows as Wisp, her invisible playmate. Wisp's duty is to keep Jenn in Marrowdell. By love, if he can. By her death, if he must. But time is running out. What Jenn unknowingly feels is the rise of the Verge's magic within her, a magic that will threaten her and those she loves. Worse, this summer will end with a Great Turn, and strangers seeking power at any cost have come to Marrowdell to try to force an opening into the Verge, to the ruin of all.